Set and ready for his first ever single release on Formatik+ is the German producer Dennis Beutler, a DJ and producer on the rise who's been active on the scene since 2012 and already rocke , d dancefloors with selected releases and remixes on his own Solved Records label as well as on Erase Records, Happy Techno Music and various other imprints throughout the past years, stacking up quite a bunch of dancefloor functional bangers over the course of a relatively young career. With the opening cut "Popping Drugs" it becomes pretty clear why the productions of the young German artist move crowds so effectively. Stripped down to the very essence the title track focuses on the basics, a pumping TechHouse foundation and a precisely arranged bass groove, garnished with a few sparse, atmospheric vintage sweeps and two short main vocal samples are well enough to keep crowds going for hours and hours, fully losing control and drifting off into a state of steady dancefloor hypnosis. 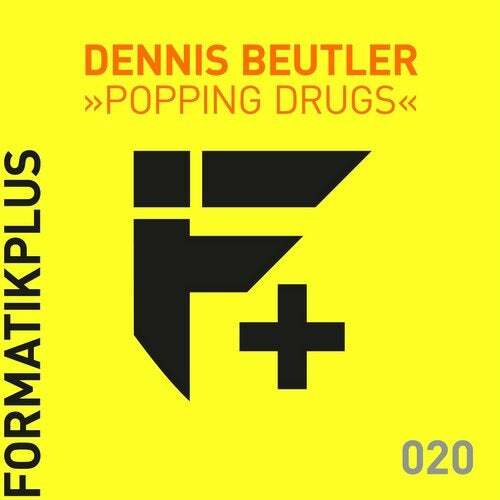 The follow up named "Freak" sees Dennis Beutler going even deeper into his trademark groove mode. Presenting a slightly more muscular approach alongside precise drum rolls and plenty of subtle, yet straightforward energy this one is another high quality cut straight from the ever effective sound labs of Dennis Beutler. For a closing "Riddim" Dennis Beutler teamed up with ALXJ for a studio session resulting in a conjunctional high energy TechHouse effort with a slightly tribalistic edge alongside a sweet hi-hat shuffle, multi-layered percussions, an undeniably seductive vocal hook and well dubbed out FX falling into place to be one of the highlights of every groove-oriented DJ set throughout this years open air season.